Review: Armie Hammer in the coming-of-age film "Call Me By Your Name"
It is 1983. And there are few better places to spend the summer than in Northern Italy. That's where Elio (Timothée Chalamet), a 17-year-old music student, is biding time with his mom and archaeology professor dad in her family villa. And what a villa: a beautiful, rambling old house with servants whose routines keep the place ticking. In the summer heat, Elio reads, transcribes music, and passes the days swimming and making out with the beautiful Italian local girls, because who wouldn't. But into this idyllic vacation time comes a "usurper," as Elio calls him: a friend and former student of his dad's, who has come to stay in the house both to assist the professor and to pursue research of his own. Oliver (Armie Hammer), a strikingly handsome man, fit, with grey barely infringing around his temples, has been offered Elio's room, and the boy decamps for the smaller space next door. From the start, Elio is thrown by Oliver and by a flurry of conflicting emotions and vibes. He deems Oliver to be confident; no, he denigrates him as being arrogant. He's intrigued by his worldliness and knowledge; no, he's put off by his sense of entitlement. But there is a magnetism about Oliver that attracts Elio in a way the local Italian girls do not. And his own discomfort -- and Oliver's teasing -- tear into him, as he hesitatingly broaches a physical relationship. Because he is young and does not know what he wants. 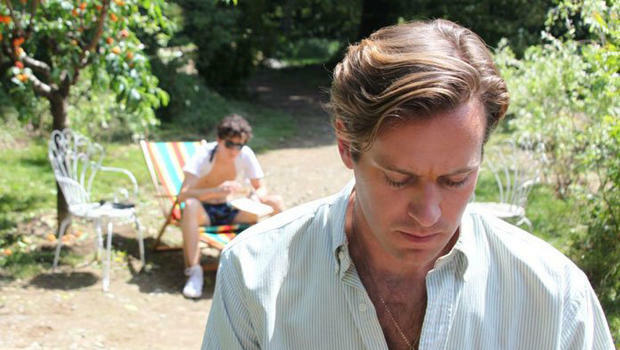 "Call Me By Your Name," an exceptional new film by Italian director Luca Guadagnino (who directed Tilda Swinton in "I Am Love" and "A Bigger Splash"), is insular -- it's based on a Proustian novel by André Aciman, with a screenplay by James Ivory -- but it eschews the narrator's voice. Instead, we observe a sensitive young man making tentative forays into the world of romantic entanglements, and learning how all-consuming they can be. The film bowed Tuesday at the New York Film Festival, after premiering at Sundance. Coming of age films are a well-worn genre, usually portraying a nostalgic look back at first love or first heartbreak. As Guadagnino noted in a press conference in New York on Tuesday, one cliché of such movies is that the protagonists may face some opposing force (disapproving parents, a rival for affection, or a community or authority figures seeking to reinforce social norms) that they must overcome, or fail to. What if the lovers existed without the crushing weight of resistance or of forces trying to keep them apart? Left to their own devices, in the bubble of freedom that a summer vacation affords, would they take the chances they might later regret not taking? "Call Me By Your Name" is free of that conflict, leaving the drama to rise or fall upon Elio and Oliver's own discretion, or lack thereof. Chalamet's performance as Elio is remarkably attuned to a teenager's awkwardness and corresponding sense of certainty. Hammer, most memorable as the Winklevoss twins in "The Social Network," is terrific as the object of attraction who seems just slightly out of reach, but who is also self-aware enough to appreciate the power he has over an impressionable youth -- a delicate balancing act for Hammer, as Oliver is just millimeters from being a letch. And for playing a professor of archaeology, Michael Stuhlbarg probably represents the most forward-thinking parent in movie history. Kudos to the film's cinematographer, editor, production designer and costumer, for making a summer in the 1980s palpably alive again, though the emotions depicted pretty much exist outside of time. "Call Me By Your Name" (screening today and Wednesday at the New York Film Festival, before opening in New York and Los Angeles on November 24) is distributed by Sony Pictures Classics. 132 mins. The film is rated R, for sexual situations, some involving fruit. To watch a trailer for "Call Me By Your Name" click on the video player below.